The 9th International Conference on Community-Based Adaptation (CBA9) took place in Nairobi, Kenya, from April 24-30 2015. The CBA series of conferences focus on the latest developments in community-based adaptation to climate change. The theme of this year's event was "Measuring and enhancing effective adaptation", and all the posters presented at the conference were summaries of projects related to the conference theme. This poster is one of the posters featured at the conference. For more information about CBA9, visit: www.cba9.org. If you want to learn more about community based adaptation, please visit the GICBA platform on weADAPT. 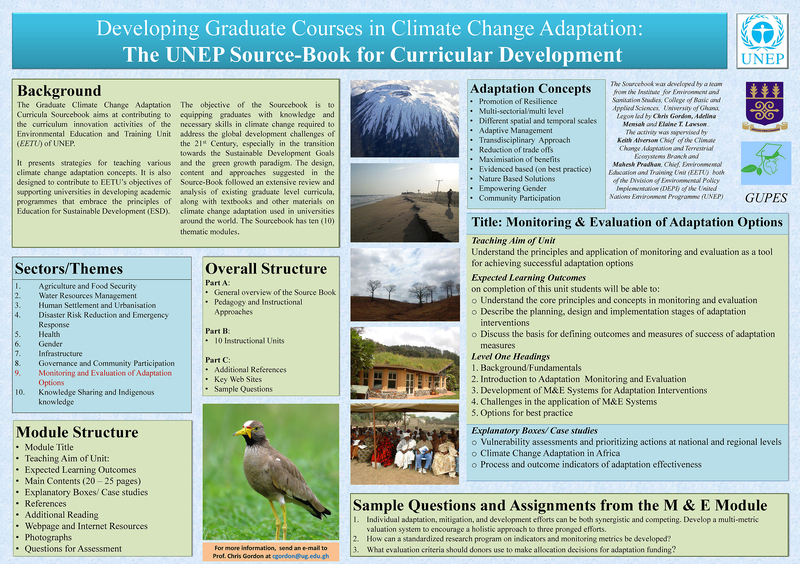 The Graduate Climate Change Adaptation Curricula Sourcebook aims at contributing to the curriculum innovation activities of the Environmental Education and Training Unit (EETU) of UNEP. It presents strategies for teaching various climate change adaptation concepts. It is designed to contribute to EETU's objectives of the supporting universities in developing academic programmes that embrace the principles of Education for Sustainable Development (ESD). The objective of the Sourcebook is to equipping graduates with knowledge and necessary skills in climate change required to address the global development challenges of the 21st Century, especially in the transition towards the Sustainable Development Goals and the green growth paradigm. The design, content and approaches suggested in the Source-Book followed an extensive review and analysis of existing graduate level curricula, along with textbooks and other materials on climate change adaptation used in universities around the world. The Sourcebook has ten (10) thematic modules. To view an enlargeable version of this poster please open the poster image above in a new tab or browser window (this can usually be done through right-clicking on the image and selecting this option from the drop-down menu). This poster was produced by Professor Chris Gordon. This poster is one of the posters featured at the CBA9 conferance 2015. For more information about CBA9, visit: www.cba9.org. This poster is one of the posters featured at the 9th International Conference on Community-Based Adaptation (CBA9) in Nairobi, Kenya, from April 24-30 2015.